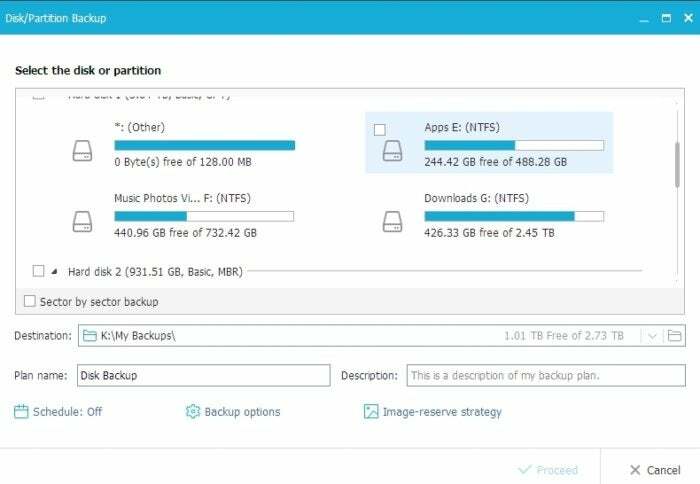 EaseUS ToDo Backup Home 10 may not have the cachet of rival Acronis True Image, but it’s nearly as capable. Perhaps more so for the average user if you count its ability to back up to online services such as Dropbox, Google Drive, and OneDrive. It also supports LTO 4 tape, which alone warrants an upgrade to the program’s $30 price tag if you’re one of the diehards still rocking serial storage. Having not seen ToDo Backup for several full versions, we were pleasantly surprised at the revamped interface. The appearance and organization are far cleaner, and the workflow is more intuitive. Icons are clearly labeled so there’s no guessing what’s what, at least if you understand the jargon. For instance, “mount” refers to opening existing backup images so that they appear as a drive letter, letting you browse their contents in Windows Explorer. Even we didn’t understand what “Include all contents referred to Reparse Point” meant. It should read “referred to by the reparse point,” which means if you have a shortcut to My Documents on your D drive, the contents of the actual My Documents folder will be backed up along with the D drive. However, beginners might not know such things, and with the help file online you have to open a browser to get an answer. Despite the lack of local help, ToDo Backup’s interface and workflow really grew on us. It’s quite possibly our favorite in the backup realm. ToDo Backup’s clean-shaven appearance lets you concentrate solely on creating the backup job. Having all the appropriate options within easy reach also helps. Other features include a drive clone function (MBR only, not GPT in our testing) that will optimize sector offset for SSDs; a disk wiping (secure delete) utility; and even an optional boot time recovery, which allows you to select the EaseUS option at a boot prompt and restore your system without a boot disc. EaseUS provides both Linux and Windows PE boot images that can be burned to CD or installed to a USB drive. You can also write an ISO for burning with another program, or booting from across the network. There’s a Smart Backup, which backs up the Windows system libraries (Documents, Pictures, etc. ), and a dedicated email backup function, though it’s limited to Microsoft Outlook. The one feature ToDo Backup lacks is plain old file copying or syncing. Even when not done in real time as with Aomei Backupper, mirroring important folders is a nice way to keep your most important data handy in case of a system failure or data disaster. Where ToDo Backup really shines is in the wide variety of backup destinations it supports: hard drives and SSDs, optical discs, tape, network locations, FTP sites, and even DropBox, Google Drive, and OneDrive. You’d be surprised at how much tape and optical remains in the world, if not the consumer space. And online? That’s a great feature that’s also nearly universal on NAS boxes. We’re at a bit of a loss as to why more backup programs don’t support it. ToDo Backup supports hard drives, tape, optical disc, networks, FTP, and even online services. We also appreciate the fact that ToDo Backup creates only a single background process. Rivals such as Aomei, Macrium, and Acronis create several, and too many can substantially slow down system boot times. Keep it clean, lean and mean, we say. 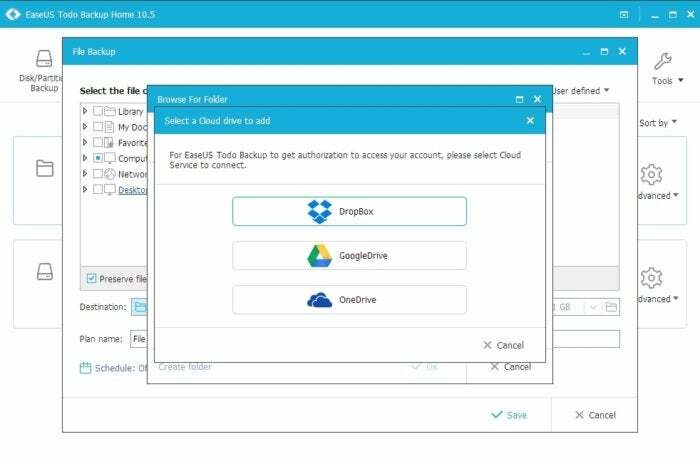 EaseUS ToDo Backup Home is a great backup program, well suited to the home and SMB space. 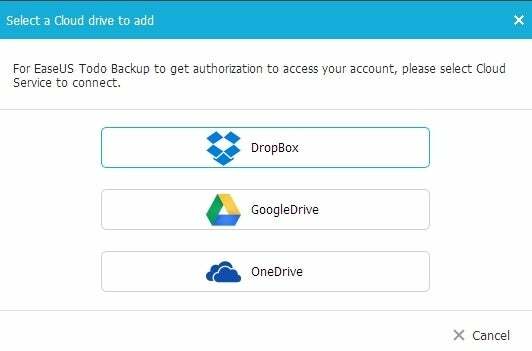 Backing up to Dropbox, Google, and OneDrive is a feature that should sell the program to many users—every backup plan should have an off-site component. We’d like to see plain file backup and syncing, but that’s a minor beef. Note: This article was edited to note that the clone function did not support GUID Partition Table disks in our testing, only those using the older MBR scheme. This contradicts some information on the Easeus Web site.